Welcome to Echo Mass - a creative space for those who seek inspiration. I document my adventures in travel, style, and life in general. Hope you have a nice stay! Shoot me a line to connect! What would it feel like to lose all your senses? No smell, no taste, no touch, not a single sound. What would it feel like to float as if you are in space? To answer all of these questions I decided to find a place in Chicago that provides sensory deprivation experience - Studio Float Sixty. To be honest, I was scared going in. Not of the experience itself, but of how it will influence my mind. When you meditate, you try to detach from the environment. But what happens if you actually get to that state of the nothingness? Do your thoughts finally get to chill out for a moment or do they get even more scattered? All these questions kept bouncing off the walls inside my head! Instead of getting more stressed out about the experience that was supposed to do the exact opposite, I counted to three, exhaled and booked an appointment. 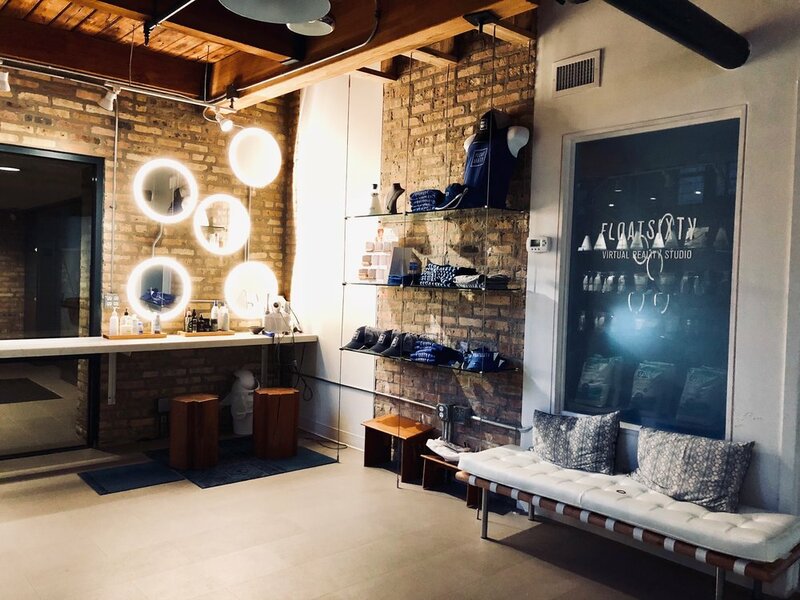 Float Sixty is conveniently located in River North in the middle of everything. In case I wasn’t going to enjoy the no-sensory float, I figured I could at least please one of the senses, my taste buds, in one of the restaurants nearby. The studio makes you feel relaxed the moment you walk in. I was informed that there are several rooms with different types of capsules and tanks. I chose the one that looks like it just landed from the outer space. It was only missing that pshhhh sound and steam when I opened it like it happens in the space movies. For whatever reason I thought it would be deep, but it turned out it’s only 10 inches of water. That made me feel less scared, knowing that I can actually touch the bottom whenever I want to. What I didn’t know is that it is impossible to sink, because the water contains 1000 pounds of Epsom salt. You need to be completely naked, take a shower, put petroleum jelly on all of your scrapes and protect your ears with plugs. And then the actual experience begins. You have an option of leaving the light on, but I wanted to do it right. So I put the top down and turned the neon off. But it wasn’t as easy to turn the mind off. Well, first, it wasn’t easy to relax, period. Your body is not used to be in that position. My muscles tensed up like I was holding a plank, and it took a few minutes and many yoga breaths to finally start floating. I’ve read several reviews and it seems like everyone has a very different first experience. I usually fall asleep the moment I close my eyes. So in the complete darkness I expected to fall asleep instantly, like a bird when a cage is covered. Instead, I started daydreaming. Like I wasn’t actually thinking about anything, but my mind started producing these weird scenarios one after another. All of them bizarre and none crazy enough to actually remember. And then I tried to stay exactly in the middle of the tank so I don’t touch the walls at all. It felt very very relaxing and safe. Yes, safe is a good description. I didn’t want the time to run out. All I could hear was the water splashing if I was moving. So I stayed still till I accidentally lowered my head too deep and got some water in my eye. Let me tell you, salt water in your eye is so not fun. There is a spray with fresh water inside the tank for accidents like that, but I actually had to get out and rinse it out. The water is so dense with salt that my skin felt like as if I were a dolphin. When you are in a capsule, you definitely realize that time, in fact, is very relative. It went by so fast, yet felt like an eternity. I left feeling refreshed, light and inspired. I was also a bit dizzy, because the muscles in my neck that are always super tense finally relaxed like they never do and I think all the blood rushed in my head and overfilled it with oxygen. I highly recommend everyone to go float at least once! I guarantee you have never felt, or actually not felt anything like that in your entire life. Stay updated on the new posts! Dec 11 Is Simplicity the Answer? Be the first one to get updates! © EchoMass.com All Rights Reserved.